This entirely new edition of a very successful book focuses on developing professional academic skills for supporting and supervising student learning and effective teaching. It is built on the premise that the roles of those who teach in higher education are complex and multi-faceted. 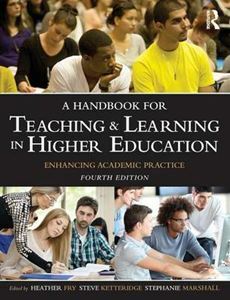 A Handbook for Teaching and Learning in Higher Education is sensitive to the competing demands of teaching, research, scholarship, and academic management. The new edition reflects and responds to the rapidly changing context of higher education and to current understanding of how to best support student learning. Drawing together a large number of expert authors, it continues to feature extensive use of case studies that show how successful teachers have implemented these ideas. It includes key topics such as student engagement and motivation, internationalisation, employability, inclusive strategies for teaching, effective use of technology and issues relating to postgraduate students and student retention. * Part 1 explores a number of aspects of the context of UK higher education that affect the education of students, looking at the drivers of institutional behaviours and how to achieve success as a university teacher. * Part 2 examines learning, teaching and supervising in higher education and includes chapters on working with diversity, encouraging independent learning and learning gain. * Part 3 considers approaches to teaching and learning in different disciplines, covering a full range including arts and humanities, social sciences, experimental sciences through to medicine and dentistry. Written to support the excellence in teaching and learning design required to bring about student learning of the highest quality, this will be essential reading for all new lecturers, particularly anyone taking an accredited course in teaching and learning in higher education, as well as those experienced lecturers who wish to improve their teaching practice. Those working in adult learning and educational development will also find the book to be a particularly useful resource. In addition it will appeal to staff who support learning and teaching in various other roles.